Both Waite daughters have powers. They are orphaned, and now that they are out on the road, it seems that they have attracted the attention of various horror-style predators. The story alternates between the weird road trip and flashbacks to childhood, leading up to the murder for which Martha was serving time. As the name implies, hawks make an appearance on a regular basis… and they aren’t friendly. In both storylines of A Hawk in the Woods Abby is the point of view character, and I commend Laben for creating a character who is interesting without being at all likeable. It is believable that someone raised in the environment she was would develop as she did; it’s a little harder to understand Martha in contrast. One nice point in the story was Abby’s fixation with social media. It took me a while to understand why she is constantly composing tweets in her head or imagining an Instagram image. There is a magical reason that is nicely revealed. The tension ratchets up as the women are pursued by another branch of the Waite family, who want their powers, by entities attached to their own family line, and by those increasingly aggressive hawks. Laben expertly navigates the concept of a family dynamic founded solely on power, and an attitude toward one’s own children based so completely on exploitation that it’s practically a form of cannibalism. Less clear, for me, were the mechanics and limits of Martha’s ability. Martha, the victimized and passive sister, has the greater power, and it’s a nifty one, except I never fully understood how it worked and what the limitations were. It seemed like it was not an illusion, but I needed to understand the sphere of influence, and unless she’s affecting the entire world, it seems like this ability would soon be noticed and set off an investigation. If she is affecting the entire world, that would also be noticed. 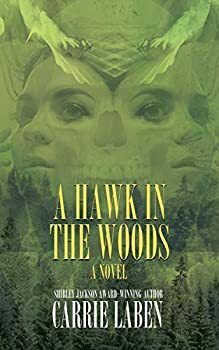 A Hawk in the Woods has moments of perfect detail or everyday life, juxtaposed with creepy and shocking images that are completely plausible in this world. Abby’s ruthlessness is also completely plausible. For me this is the perfect blend and the hallmark of a good horror story. I liked the increasing tension, and I enjoyed watching Abby’s growing relationship with her grandfather. I think horror fans who are conversant with the Lovecraft oeuvre will really enjoy this one. This sounds interesting! And I really like the cover art.